A man has been charged with causing the death of a pedestrian who was hit by a car that had earlier been pursued by police. 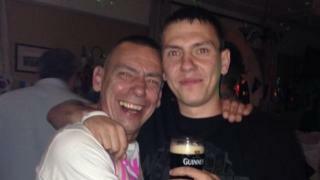 Paul Collinson, 54, died outside the The County Hotel in the Walker area of Newcastle on 23 September. Northumbria Police said officers had tried to stop a VW Passat shortly before, but it had driven off. Kyle Hutchinson, 20, of Praetorian Drive, Wallsend, has been charged with causing death by dangerous driving. Another pedestrian and two other occupants of the car were treated in hospital for non life-threatening injuries. A police spokesman said Mr Hutchinson had also been charged with three counts of causing serious injury by dangerous driving and one count of causing death by driving while uninsured. He is due before North Tyneside magistrates on 30 April. Paying tribute to Mr Collinson, his family said the father-of-three had a "smile as big as his heart".